Okay, the pitocin. I was able to put it off for a stint, but I had been kept awake for 24 hours and lost my resistance. Pitocin, without a doubt, is a terrible experience. And I didn't have the stamina needed to sustain it. After three hours of fast-paced, hard irregular contractions that raked my body with pain, I caved and got an epidural. Meanwhile, they cranked the pitocin all night and by morning I was suffering in an immobilized state. They inserted a catheter into me because I could no longer get up to pee and I still was able to feel it going in. This is a crappy way to labour. 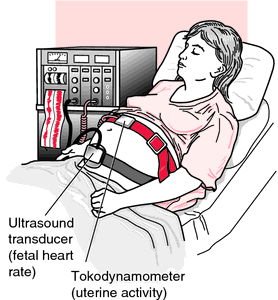 When the nurses changed shifts, my fetal monitor had slipped. The nurse freaked out at the new erratic numbers and started rolling me around and the OB came in and wanted to attach a monitor to baby's head, up my cervix, which was only 5 cm after all that. At this point I said simply and loudly, "No. Just get him OUT. I want a cesarian." And that's what happened. It was quick, I was scared, the Dude was left behind with no instructions and I was wheeled out of the delivery room and to the OR. I had to lay in a crucified Jesus pose while I was hooked up to things, given more anaesthesia and prepped for surgery. My midwife came and sat with me, offering comfort and eventually the Dude was given a place beside me. There was pressure. I held the Dude's gaze the entire time, and it was the only thing keeping me calm. I love that man, I really do. He had no interest in watching the procedure. He was there for me. The curtain draped over my face quite a bit, my torso being so short, and it was yet another minor indignity. We heard, "It's a boy! And he's peeing!" John was proclaimed a healthy baby, 9 pounds 13, and scored a 9 out of 10 on his Apgar. All the concern over him was unwarranted. The placenta looked in good shape, I'd had a lot of fluid and the cord was great. I cried when I heard him cry. The Dude was crying and we had a son. He doesn't look a thing like a newborn. He instead looked about 2 weeks old or more. His neck was strong and he could already hold it up some. He latched to my breast within 40 minutes of the birth. Slightly overcooked, but seemingly healthier and stronger for it. My body sustained him well, but never seemed to be able to transition out of the pregnancy. The recovery was a little rough. We paid a little extra and got a private room since we'd be there awhile. Unfortunately, the sleep deprivation was constant. I was woken up frequently by staff to give me meds, take my vitals or talk to me about various things. And this was on top of Jack (Which is my preferred nickname for my son) waking up and needing us. Rather than go into a lengthy sleep, he began a cluster feed immediately and I was nursing all the time while the Dude changed diapers. Eventually I developed hives. They spread all over my body and itched horribly. I was given Benadryl, which worked, but they still came back. I was exhausted. I found nursing challenging with my incision and the pain meds were only enough to take the edge off, not eliminate it. I needed help up for everything. I could barely walk. The Dude was in and out a lot running necessary errands and fielding phone calls and texts, getting me drinks, and getting himself food since they would only feed me. I was discharged after two days, hives in full effect, pain constant and feeling highly depressed about my chances of taking care of a baby. The Dude talked to my aunt and she came a little early to be with me. My father-in-law, now in town, took us home and I was helped into bed. My hives spread to my face and my lips looked like bees had stung them. My aunt arrived and after more Benadryl my hives subsided. It was a battle for another day or two to keep them away. I developed more nursing issues after that. My milk didn't come in. I was only getting colostrum and Jack was going hungry. After losing 12% of his body weight, he was put on formula and I had to start pumping to generate more milk. But this proved difficult. I was still exhausted and needed to nap, eat, tend to my body and the manual pump I had was not very efficient. The Dude went out and bought an expensive electric one. It works great, but I only got to use it once. Last night I developed a fever of 38.6 C (Almost 102 F). It started with uncontrollable shakes and chills. After a couple hours I was heating up. My midwife said to go to the emergency room, and my father-in-law came over and drove us to the ER while my aunt stayed with the baby. We were there till 4:00 a.m. The woman beside me, separated by only a curtain, was not given much chance to last the night and her family surrounded her as a priest gave her Last Rites. They took blood and urine and I was sent home with an appointment for an ultrasound for 1:00 pm, which my father-in-law also drove us to. I wrote part one of the story before this appointment. The ultrasound was 45 minutes behind schedule and it was both an abdominal and a trans vaginal. I was uncomfortable. After going through the ER again I was informed I had Endometritis, an infection of the uterus. I'm now alone in a hospital room away from my family for up to two days. I've cried a lot today. I'm tired. I'm low. I'm afraid of losing my milk. It'll be hard to pump in this room. It's from 1930, the whole ward is outdated and sorta scary and what few plugs there are are inconveniently located. The Dude fought the staff to get me a private room, and that is sustaining me right now. That and the knowledge that it's either this line of treatment or I pretty much suffer indefinitely. Jack is in good hands, the Dude is home and finally getting some needed sleep and I guess now is the time to rest, myself. So now I sleep. Tomorrow brings antibiotics, hospital food, pumping efforts, and complicated trips to the bathroom.